Agencystem is back and this time they brought their own army along. Join the ride for this epic blend of Electronica, Rock and Ethno sounds as the army of the forsaken gets ready for the last battle. 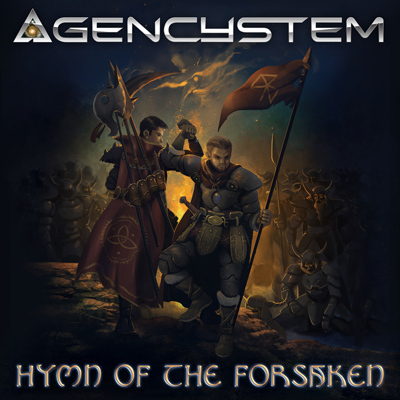 "Hymn of the Forsaken" is now available as MP3 or FLAC download. 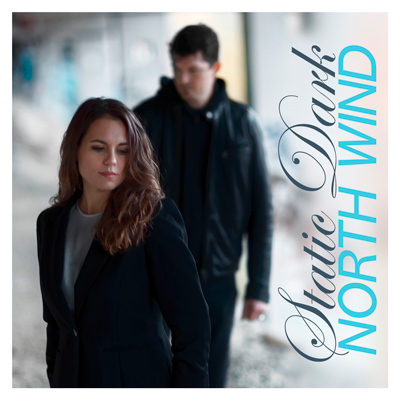 After "Once" follows the new single "North Wind" by Static Dark. The Electronica artist is supported by Andreas Svarc (Piano) and Fabienne Röthlisberger (Vocals). Beside the Original Version there is also an Instrumental Version available. You'd like to have a smoothie? You're welcome. 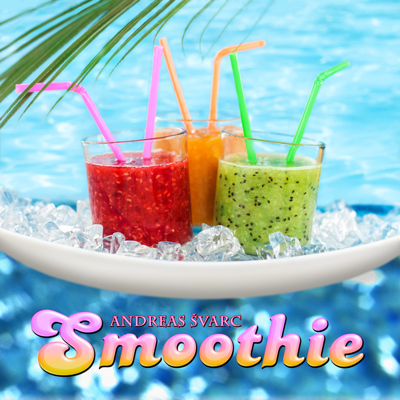 Andreas lets the summer end with this relaxing Fusion-Smooth Jazz song. Together with Patrick Bianco on the saxophon he creates a beautiful twilight atmosphere no one can escape. 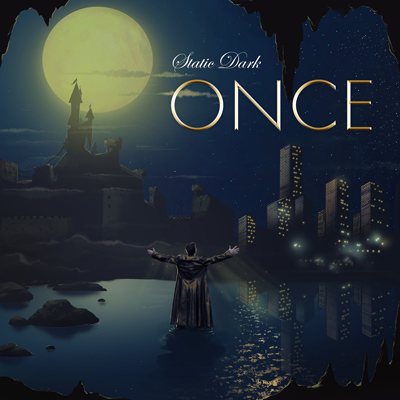 Static Dark strikes back with new single "Once"
"Heal the World" is a cooperation between Jazz pianist Andreas Švarc and grammy award winning US singer Skyler Jett. 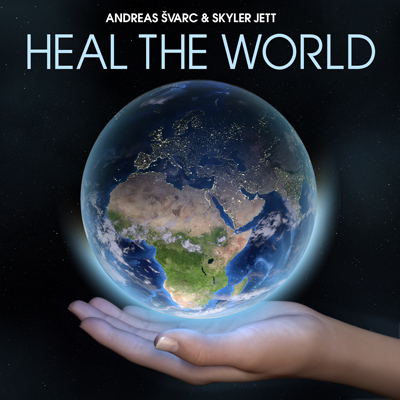 With this song, they want to support charitable causes and projects for a better world. 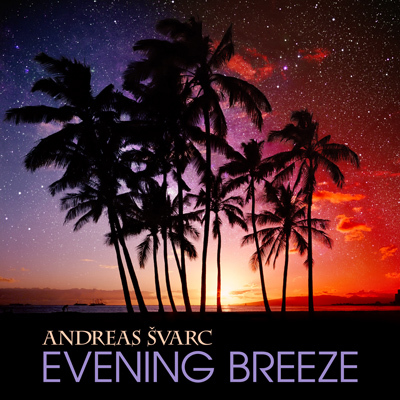 "Evening Breeze" - The new single by Andreas Svarc. Now available! Hear the spring rustling in the trees. Listen and enjoy. Third single "Saga" is now available! 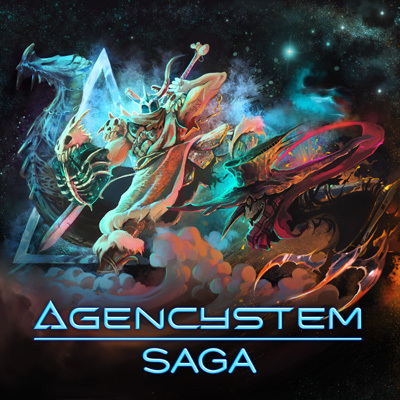 Listen to the new single "Saga" of the electronica duo Agencystem. Have fun! 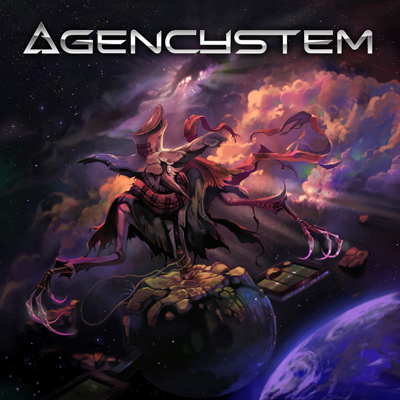 We proudly announce today's worldwide album release of the Swiss Electronica duo Agencystem. You can get the self-titled debut as digital version on Amazon, iTunes and every other major digital store as well as the limited first print edition, which includes the bonus track "Orbyte" on CDbaby or right here at the asme music store. Save your copy of this collector's item soon (limited to 500 pieces with printed number on the digipack back side)! If you'd like to get an overall impression of the 74 minutes album you can watch the official album teaser right here. The claws of the Stellar Scarecrow have cut the album version to a short radio edit! Listen to a preview sample now and look forward to the album, which will be released on September 4th, 2015. 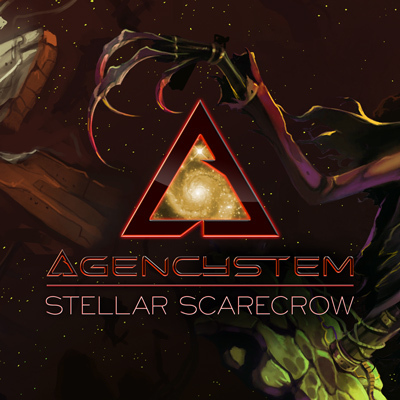 Right before the album release of Agencystem you get the chance to check another song called "Stellar Scarecrow". Watch out and don't get eaten by this insane creature! The single comes on Friday, August 21st 2015 with the radio edit (3:34). The album (release: September 4th 2015) will contain the full length version of the track (7:22). We have some amazing news to share with you! 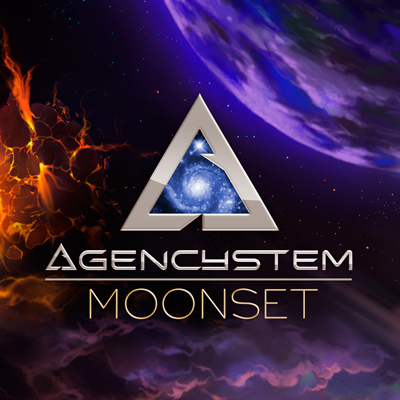 On Friday, September 4th 2015, the debut album of Agencystem will be released. The title is called "Agencystem", just like the band itself. There will be a limited first print edition (500 pieces) on CD. 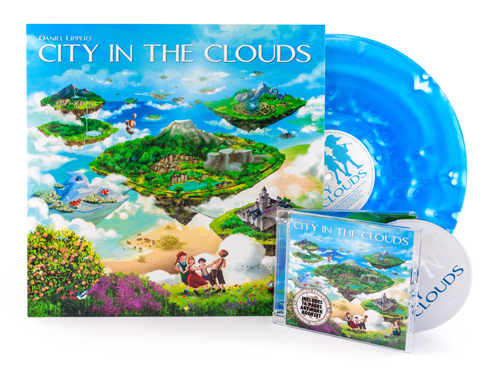 The detailed cover and the album CD artwork were created by Timojím Nadha Ilufí Jara, who already worked for Daniel Lippert's album "City in the Clouds". "Agencystem" will include 10 songs. The limited first print edition will have an additional bonus track. You can pre-order the album starting August 14th, 2015 on iTunes and right here on the asme music online store. Mellow hangs the moon before it sets, so let Agencystem provide the right mood for you with a different style of Electronica. Floating melodies glide over deep, cool bass grooves, „Moonset“ is the right choice if you’re looking for chill-out, yet pumping instrumental music. "Moonset (Radio Edit)" is now available worldwide on all important download platforms, as well as here on asme music. Check out the 90 seconds preview and get an impression of the forthcoming album. The emerging Electronica duo from Bern are now joining asme music. Static Dark collaborates with the multi-instrumentalist Jack Burn, who is a good friend of him for a long time. 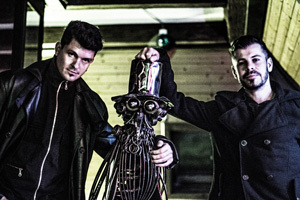 Dark and Burn founded "Agencystem" in 2006 and are working now for their debut album together with the producers Daniel Lippert and Nick Button, who already handled Dark's successful "Cross-Section". Got some holiday shopping to cross off your list? Or, treat yourself to something you've had your eye on! 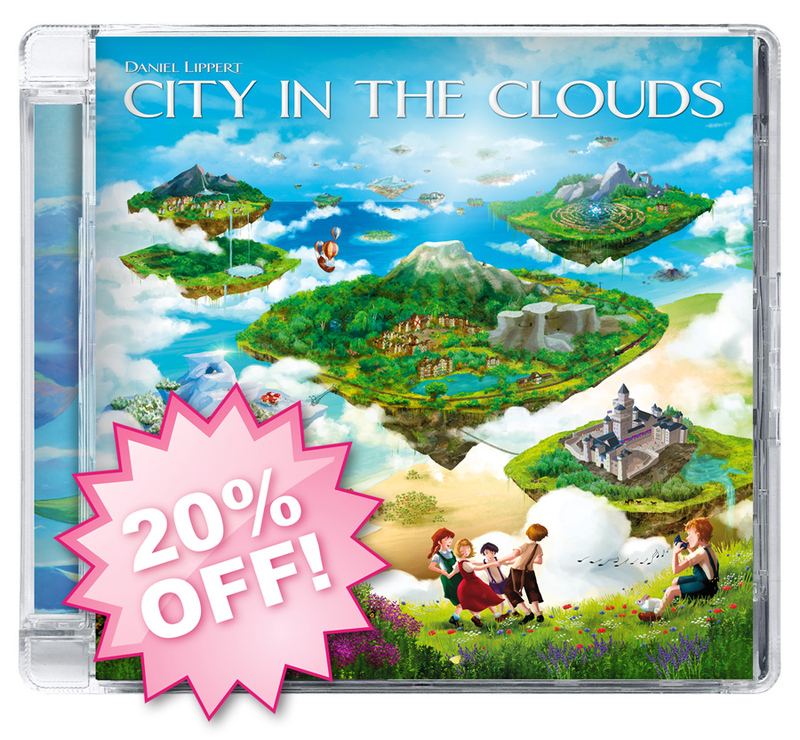 During December you can take advantage of at least 10 % discount on all CDs and Vinyl, for example "City in the Clouds" Limited CD + LP by Daniel Lippert for only CHF 29.95 instead of CHF 34.95. 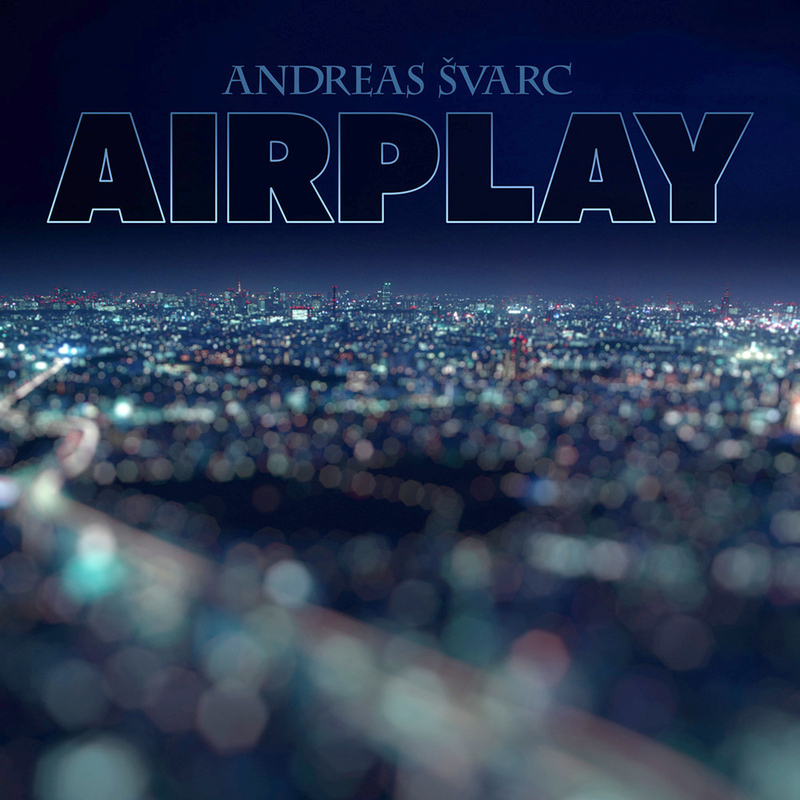 New single "Airplay" by Andreas Svarc now available! "Airplay" can now be ordered on all common download stores or right here on asme music. Andreas says a big "thank you!" in advance for your support! 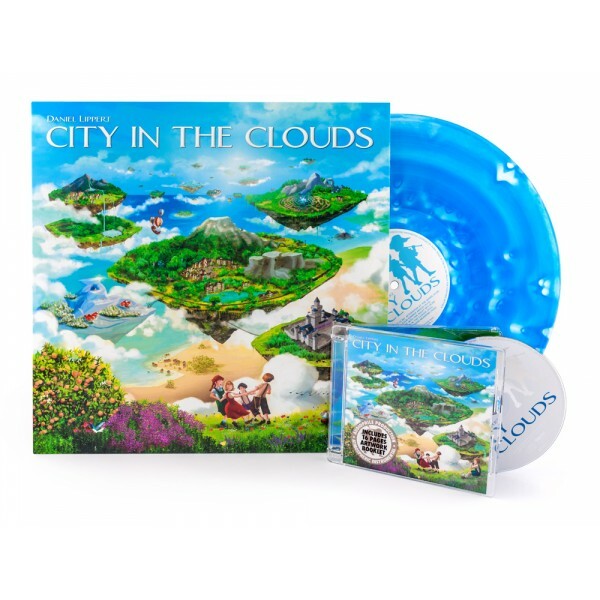 Vinyl-LP of "City in the Clouds" available now! Finally, after long weeks of waiting, the vinyl record of Daniel Lippert's debut album "City in the Clouds" can be delivered now! Present yourself or a friend of yours for christmas. The LP can be ordered here. There's also a bundle available which includes the record and the CD. Get the set here. The long awaited LP "City in the Clouds" by Daniel Lippert will be released on friday next week. Benefit from the pre-order discount of 20 % until thursday, 28th November 2013. Get your copy now before it is sold out! Here you can find all details about the LP. Time to celebrate! Today is the release of the long awaited debut album "City in the Clouds" by Daniel Lippert. The album is worldwide availabe as download and on CD. The music and artwork is made with so much love which is quite unusual today. Surely this instrumental album becomes a timless classic. Everyone with an affinity to fantasy, anime, video games or new age in the style of Enya or Enigma, in fact anyone who loves the sound of the 80's will love this album! Andreas Svarc, Andy Schaub, Fernando D'Amico, Javier González Garcès, Sabina Weyermann and Sandro Friedrich. During the whole production progress Daniel has been supported by Nick Button, who also co-arranged a few songs and produced Static Dark's album "Cross-Section". 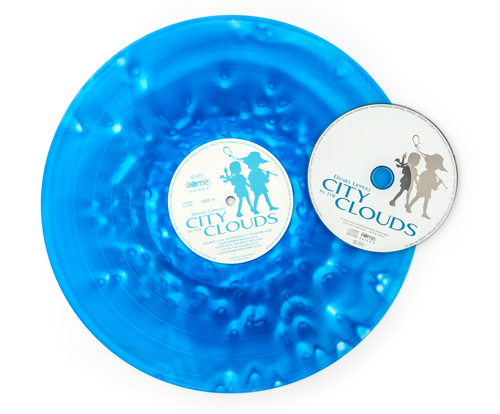 "City in the Clouds" is availabe on CD with a 16 pages artwork booklet here on asme music or on CDbaby. Furthermore you can get the album as MP3 download on iTunes, amazon, CDbaby and asme music. Preview samples can be found on each site or here. 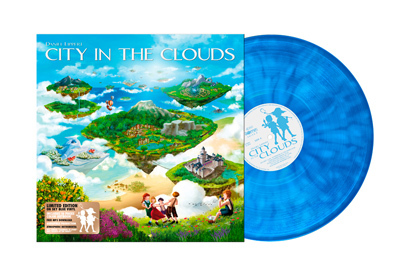 Pre-ordering for the "City in the Clouds" LP continues! The limited edition of the high quality record with 16 pages art book can be pre-ordered here on asme music with a 20 % discount until October. Don't miss it to save your copy! The CD-, MP3- and FLAC-version will be available for the regular price on other online stores like amazon or CD Baby and here on asme music as well as of Friday, September 20, 2013. Here you can get more info about Daniel Lippert. Take a mark in your calendar: the long avaited debut album "City in the Clouds" by Daniel Lippert will be released on CD and as download on Friday, September 20th, 2013. A lot of blood, sweat and tears lies within this extravaganza, which has due to its artwork already many fans all over the world. Retrospectively on the last few months, Daniel said: "The cooperation with other musicians has been a very interesting experience for me. The live performances on my album add a lot of emotion and life to the songs. I'm very thankful and proud to work with such a team, they've supported me a lot during this process. I also wanted to express my sincerest thanks for the people behind the artwork, they've done a magnificent job that topped everything I could've imagined when I started. The album as a whole has reached such a high level of perfection, much better than I ever imagined. Also, I'm pretty surprised about the positive reactions my music sparks in many people. Even though my songs don't have similarities with current popular music at all, it seems that the time is just right for an album like this. I can't wait to hold this album in my hands, and I hope many people feel like this, too!" As of Friday, September 13th, 2013 (one week before the release) you can pre-order the album on iTunes. The high quality and limited record LP with its elaborated booklet will follow in October 2013. 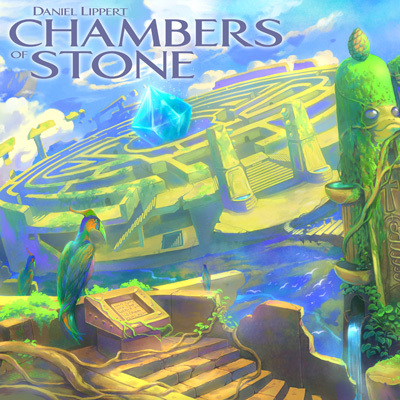 The new single "Chambers of Stone" by Daniel Lippert is now available at your favourite store. Compared to the album version, the single version has an atmospheric saxophone intro. If you like the sound of the 80's - get your copy now! --> more about Daniel Lippert's album "City in the Clouds"
The song "Chambers of Stone" will be released as third single form Daniels debut album "City in the Clouds" on June 27, 2013. The cover artwork is made by Timojím Ilufi Jara, who already drawed the cover of "Secrets of the Forest". The third single "Excursion" is also the title track from Andreas' debut album, which will be released in early 2014. Andreas' piano playing is accompanied by saxophonist Patrick Bianco, who gives this song a fitting smooth jazz flavour. New single "Secrets of the Forest" by Daniel Lippert now available! Today the second single from Daniel Lipperts album "City in the Clouds" has been released. The song is a bit darker and more mystic than the title track. Percussions, synthesizers and acoustic instruments create a deep, homogenic sound. Comparisons with Enigma, Kitaro, Deep Forest or Enya are legitimate and a compliment, too. --> more about Daniels album "City in the Clouds"
Time for a party! The debut album by Static Dark will be released on thursday next week. The intense electronic instrumental album (everyone was waiting for) has a certain magic to it which is hard not to be captured by. Not convinced yet? Have a listen to the official album teaser! Convinced already? Get the album right here at the asme music store. Beside the regular digital releases as MP3 and FLAC there's also a limited black CD edition available. Optionally you can get it with an autographed booklet. If you place your order now you can save 20 % off the retail price (valid until Wednesday, May 1st, 2013). 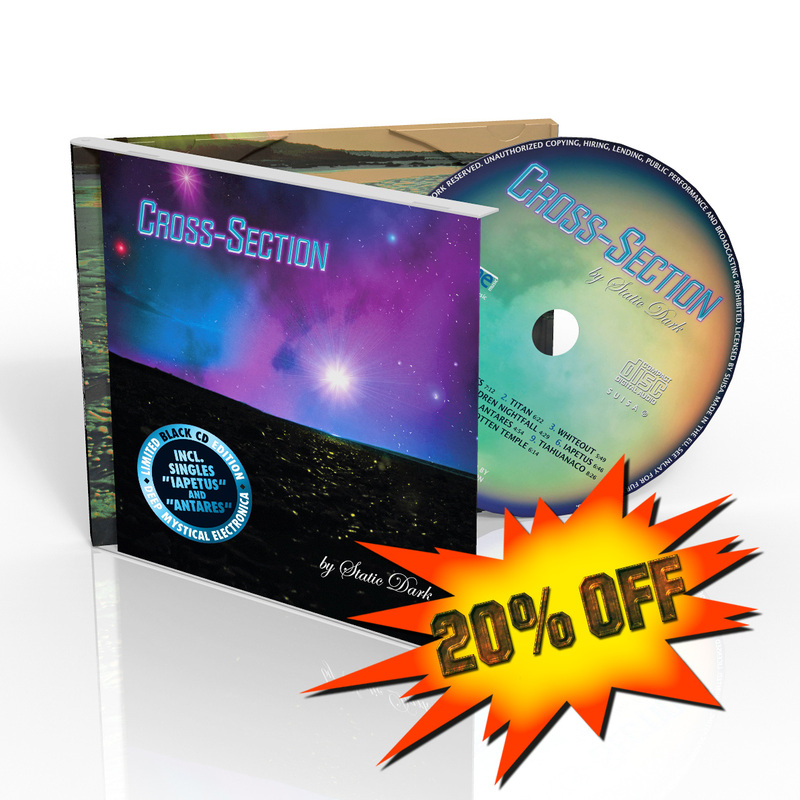 The second single from the Static Dark album "Cross-Section" is available now! Compared with the first single "Iapetus", "Antares" shows a completely new facet of Static Dark. The song is much harder and uncompromising, but still you can feel the unmistakable mysticism. --> Here you can get "Antares": asme music, Amazon, iTunes, CDBaby etc. Static Dark: New single "Antares" and album "Cross-Section"
For all those who like atmospheric and mystic electronica: be prepared. On friday, April 19, 2013 "Antares" will be released. It's the second single from the forthcoming album "Cross-Section", which comes in the beginning of may. 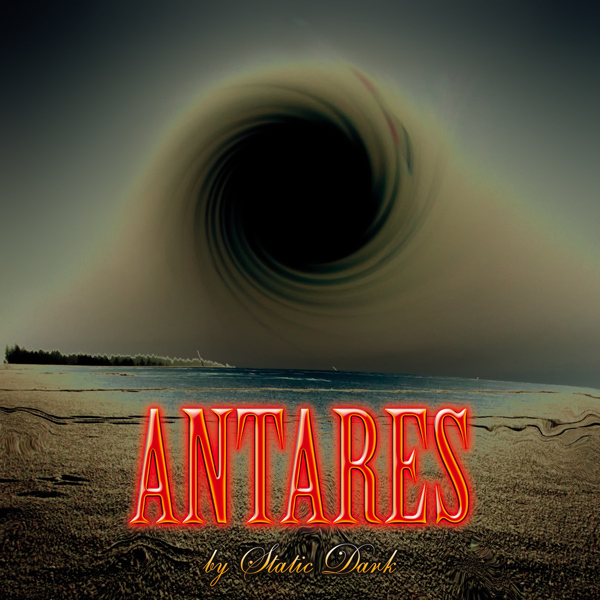 Here's the cover of "Antares". "Chill Out" is now available on iTunes, Amazon, CDBaby or right here at our store. The song was previously only available as bonus track on the single "Nesomajaka". --> Read more about Andreas and listen to "Chill Out". For all of those who didn't know the bonus track of the single "Nesomajaka" and for all who like the song: here's the brandnew music video by Andreas Svarc. "Chill Out" will also be featured on his forthcoming smooth jazz album (release 2013).